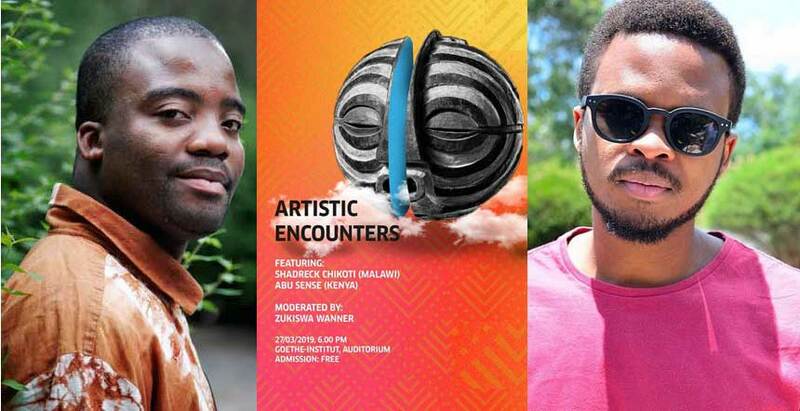 Shadreck Chikoti and Abu Sense will be the first artists to rock the stage for Artistic Encounters in 2019 at the Goethe Institut Nairobi on Wednesday, March 27, 2019. They will be moderated by series creator and curator Zukiswa Wanner. In Artistic Encounters, two artists of different genres meet and create an art experience of their combined work then share it with the audience. In 2017, the project had artist Victor Ehikhamenor and poet Koleka Putuma, trumpeter Christine Kamau and poet Philipp Khabo Koepsell, novelist Lola Shoneyin and storyteller Maimouna Jallow, as well as author Angela Makholwa and actress Patricia Kihoro. In 2018, Artistic Encounters kicked off with novelist, short story writer, and academic Pede Hollist and actor Hana Kefela in May followed in June by mbira player Prudence Katomeni and poet Adipo Sidang’. In July, novelist Niq Mhlongo and actor Nick Ndeda were the featured acts while spoken word artist Ngartia gave his rendition of the Olumide Popoola’s novel When We Speak of Nothing in September. In October, Nairobi would enjoy the stylings of Nigerian poet Dami Ajayi and Kenyan musician Makadem. The year’s final event would be a rocking evening with Sitawa Namwalie, Yewande Omotoso, and Shan Bartley. The 2019 edition of the Artistic Encounters series was announced in January with promises of great new artists. The team seems to be delivering on their promise with the first pairing of the year in Malawi’s novelist and publisher Shadreck Chikoti and Kenya’s Norman Abubakar who goes by the stage name Abu Sense. Abu Sense is an actor and storyteller who burst onto the theatre scene when he and his (acting) partner Ngartia produced and acted in the cultural phenomenon that was Too Early For Birds. (Ngartia incidentally featured in one of the sessions of Artistic Encounters for 2018). Abu Sense will be bringing to life Azotus the Kingdom (read an excerpt here) and after the show, both he and the author will participate in a panel moderated by the series curator Zukiswa Wanner. The doors open at 6pm on March 27, 2019. Previous Previous post: Babishai to celebrate 10th anniversary on World Poetry Day 2019. Next Next post: Writivism Short Story Prize 2019, Koffi Addo Creative Nonfiction Prize 2019 longlists announced.